For baseball lovers, it doesn’t get much better than Arizona Spring Training. 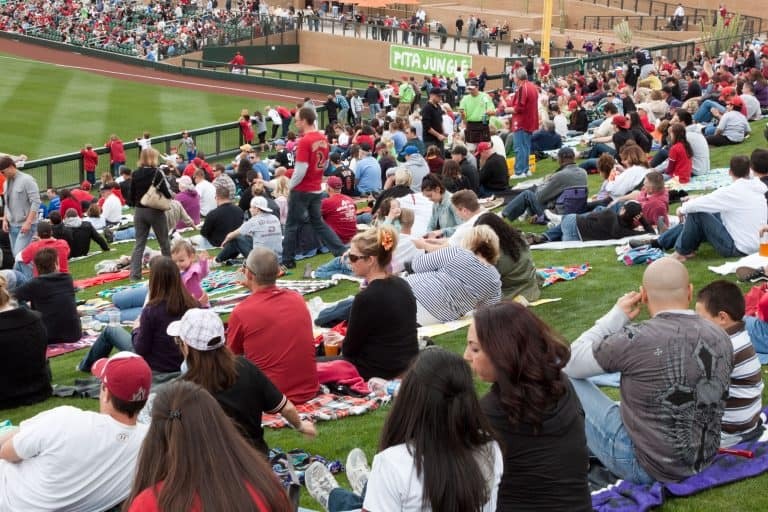 Every March, fans of America’s favorite pastime flock to the desert for bargain tickets, beautiful weather, and an opportunity to see their favorite athletes. Experience the Cactus League and enjoy Spring Training Phoenix style! MLB Spring Training games are great for all families, including those who haven’t yet developed a love for baseball. If you are a fan of multiple teams, you don’t have to worry about just choosing your favorite. The Cactus League is home to 15 teams playing in 10 stadiums all within a 45 mile radius. You can go to multiple games and catch all your favorite players. Since ticket prices are a fraction of the cost of the regular season games, families can go to a few games without spending a fortune. The stadiums are also a fraction of the size of major league stadiums. Smaller stadiums mean no bad seats and a great chance to see your baseball hero close up. The weather in Phoenix is beautiful this time of year. Take some time to enjoy a break from the cold and soak up some sun. The Sonoran Desert is home to diverse and unique plants and wildlife so find a desert trail and explore. When you’re done, the kids will love swimming in the hotel pools. Read our Top 10 Things To Do in Phoenix with Kids. Adding kids to your travel plans always requires a little different planning. Use these tips to make sure your time at the game is fun for everyone. Lawn seats are a great way to save money and give kids plenty of wiggle room. They also tend to have little or no shade. If you choose lawn seats, make sure to bring sunscreen, hats, and lots of water. And don’t forget a blanket to sit on. Most stadiums do not allow chairs. Buy your tickets early. The best seats (often in the shade) and popular teams sell out fast. Your best chance to get an autograph is while the team is warming up before the game. Get to the stadium as early as possible, then get down to the field, and don’t forget the sharpie! If you don’t make it early, you can always wait around the player exit and hope to grab an autograph as they leave the field. Some stadiums allow outside food (check stadium websites to see what is allowed) but be sure to head over to concessions to get a taste of your team’s hometown. For example, San Francisco Giants famous garlic fries are available at their Scottsdale stadium and at the Goodyear Stadium, sample Cleveland’s famous Bertman Ballpark Mustard. Don’t feel like you have to stay for the whole game. Baseball games are long, and if the kids aren’t having fun anymore, no one is. With the low price of Arizona spring training tickets, you don’t have to stick it out for 9 innings to get your money’s worth. Take off early and cool off in the hotel pool. Expand your stay and check out The Top 10 Things to do in Arizona. If you want a nice central location to visit multiple stadiums and Phoenix area attractions, check out the Arizona Grand Resort & Spa in Phoenix. Kids will love splashing in the on-site waterpark. There are many activities at and right by the resort, including hiking trails in the adjacent mountain preserve area. Discover free things to do in Phoenix. The Hyatt Place Phoenix/Mesa is within a few miles of the Chicago Cubs’ Sloan Stadium and Oakland A’s Hohokam Stadium. They also have a separate living/sleeping area and fridge in each room. Guest enjoy free breakfast and a resort style pool. The LA Angels’ Tempe Diablo Stadium, is within walking distance of the beautiful Phoenix Marriott Tempe at The Buttes. It’s sparkling waterfalls and pools are just right for families to relax in luxury after a day at the ballpark. Salt River Fields at Talking Stick is the home of The Arizona Diamondbacks. The obvious hotel choice is the Talking Stick Resort, but if you want something a little more geared toward families, check out Hampton Inn & Suites Scottsdale Riverwalk, located just across the street. Families love the free hot breakfast and complimentary shuttle service within a five-mile radius. 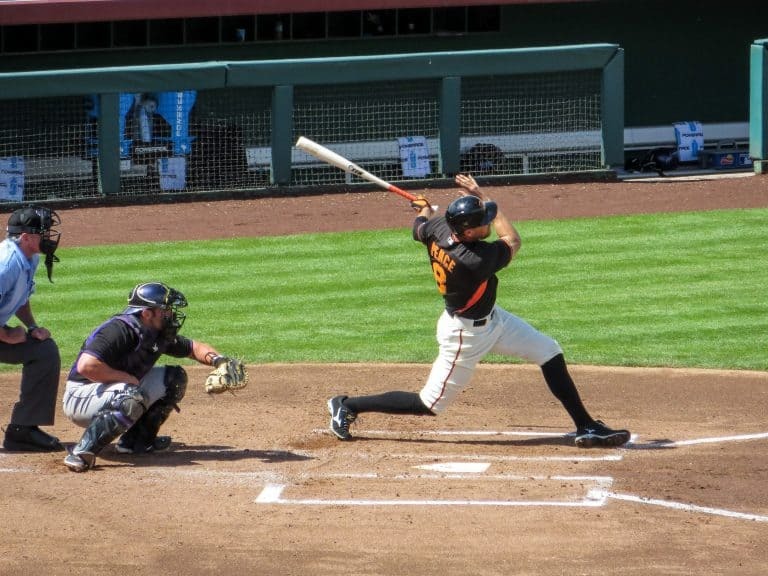 The Scottsdale Stadium, home to the San Francisco Giants, has no shortage of great hotels close by. The Embassy Suites Scottsdale Resort is located 1.5 miles away and is a family favorite due to the two resort-style pools, free made-to-order breakfast, and two-room suites. Milwaukee Brewers fans will want to be near Maryvale Baseball Park. La Quinta Inn & Suites Phoenix I-10 West offers free breakfast, microwaves and refrigerators in every room, and is only 1.7 miles from the stadium. San Diego Padres train at the Peoria Sports Complex. This stadium is surrounded by a handful of high-rated hotels including Residence Inn Phoenix Glendale/Peoria and Hampton Inn Glendale/Peoria, both offering free breakfast, in-room fridge and microwave, and relaxing pools. The Wigwam in Litchfield Park is only five miles from both the Cleveland Indians and Cincinnati Reds at the Goodyear Ballpark and the Los Angeles Dodgers at Camelback Ranch. 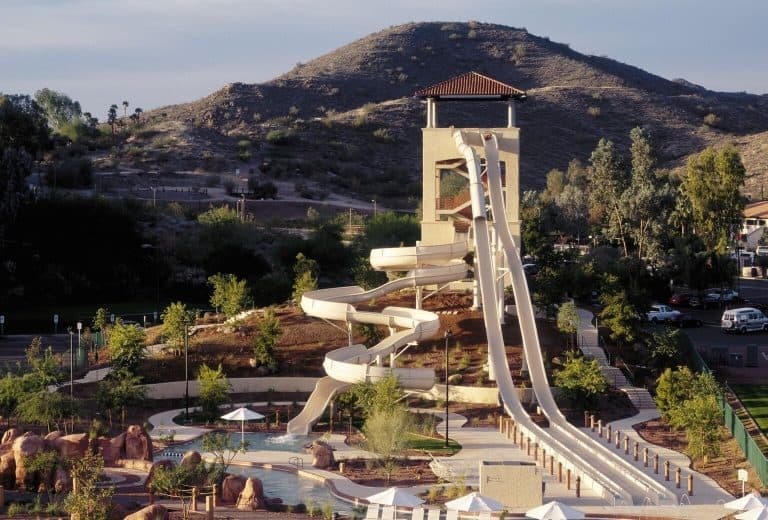 Your family will love staying at The Wigwam with its super fun pools and water-slides. Residence Inn Phoenix Northwest-Surprise is just a short walk away from Surprise Stadium, home to the Kansas City Royals and Texas Rangers. 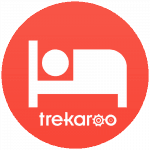 Tiffany Vaughn is the one of Trekaroo’s Travel Experts located in Arizona. She is also an avid explorer of local and remote destinations. She and her five kids enjoy tagging along with Dad on business trips to find new adventures. She believes that there are always new experiences to discover, even in your home town.